The Poker Room at Thunder Valley Casino Resort | Lincoln, CA: Who Wants a WPT Seat? Who Wants a WPT Seat? 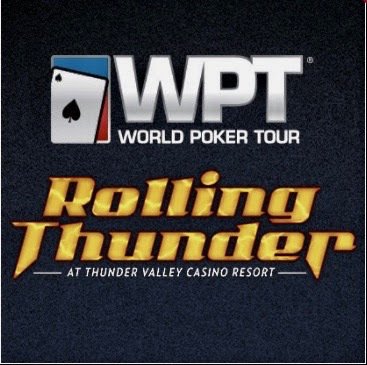 With 170 players already here - and registration open for 2.5 more hours - there's a lot of the Usual Suspects searching to win a @WPT Rolling Thunder $3500 Main Event seat in today's $440 20-seat-guarantee Super Mega. Among those here is Bob Mather and Candace Collins, Al and Sharon Sanchez, Jose and Lynda Hernandez, Kelly Douglas, Kathy Stahl, Warren Kashiwagi, Allan Fernando, Matt Boddorf, Chris Hinchcliffe, Rudy Robledo, Josh Prager, Justo Avalos, Nabil Zumout, Mario Lopez, Babe Prescott, Craig Buchmiller, Ed Miller, Theresa Cummings, Eyyal Altar, Tony Bracy, Daniel Evans, Lorena Chiquillo, Darrel Dier, Randy Gil, Jake Lipton, Zach Horton, Doyle Johnson, Tracy Oto, Kirk Rexford, Adam Sanchez, James Smith and Cheng Xiong.